This quilt design is by Bonnie Hunter. I picked it up as a Leader's and Enders project after I finished my Postage Stamp quilt because I had so many nine patches left over. The first problem I ran into was that the original design was made with 2" squares and all my blocks were made with 2.5" squares. Half an inch doesn't seem like that big of a deal, but when you multiply that across the size of a quilt it adds up real fast. To keep the quilt manageable, I reformulated accordingly with the overall number of blocks. The final quilt ended up a more reasonable size of 79" x 95". The second problem was the challenge of working a quilt on the diagonal. This was my first one built that way and it required a lot of work space to do the layout. The stretchy edges scared me and I lost a lot of points, but in the end, I just didn't care. The quilt looked great to me. The borders and bindings (as well as all the other fabrics) came from the thrift store and the quilt took nearly a year from start to finish with the time I had to work on it. I was nervous about the paisley but it worked out well with all the colors. I like doing the patchwork backs and this one seemed really appropriate with the 9-patches. There are lots of fun things to "find" with all the different fabrics like an I-spy quilt. There are also lots of memories in this quilt as I can see patches from most of my previously made quilts. The picture at the bottom is my cat inspecting her new favorite quilt. She sat next to the package the night before I took it to the post office with a disgusted look on her face. If I left it up to her, she'd keep all of them. This quilt was given as a gift to a very dear friend. I hope she enjoys it as much as I enjoyed making it. While quilting is my primary outlet, I share your feelings. I'm also not really interested in "rules" and try not to get caught up in "shoulds". Those things take away from the fun of slipping in to that "creative flow". 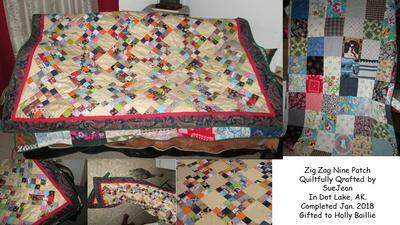 I do have several more quilts on this site with their own special stories. I love telling the background here and appreciate this site. P.S. My friend received her new quilt today and she loves it! Yay! Dont let anyone discourage your creative endeavors! I am not the run of the mill thinker and never follow the norm, or mainstream thoughts for creating a work of art! I am an artist and painter and know mixing mediums has a wonderful outcome. I think the same about quilting. I don't follow a set rule of thought about not mixing anything and I have created beautiful quilts. I have built a very nice little business making and selling quilts so the mixing of fabrics has never created issues with the actually quilt or the market place that wants them. You keep using your imagination and every scrap of fabric no matter what the texture or type of fabric. I look forward to seeing another of your quilts soon. I appreciate your insight. I hear lots of people saying "don't mix fabrics" and "cotton only", but not all of us have the budget for such things. It helps to know that it's possible to quilt on a "dime" and end up with good results. Very nice quilt indeed! I mix fabrics all the time for the memory quilts I make and I rarely have issues with the blocks. Your quilt turned out great so you did overcome the obstacles presented.